Sallie Gardner at a Gallop is a series of photographs consisting of a galloping horse, the result of a photographic experiment by Eadweard Muybridge on June 15, 1878. Sometimes cited as an early silent film, the series and later experiments like it were precursors to the development of motion pictures. The series consists of 24 photographs shot in rapid succession that were shown on a zoopraxiscope. Muybridge was commissioned by Leland Stanford, the industrialist and horseman, who was interested in gait analysis. The purpose of the shoot was to determine whether a galloping horse ever lifts all four feet completely off the ground during the gait; at this speed, the human eye cannot break down the action. The Horse in Motion by Eadweard Muybridge. Noted photographer, Eadweard Muybridge was hired, in 1872, by Leland Stanford a railroad baron and future university founder, to find out if there was moment mid-stride where horses had all hooves off the ground. It took several years but Muybridge delivered having captured a horse, named "Sallie Gardner," owned by Stanford; running at a 1:40 gait over the Palo Alto track, on 19th June 1878. Muybridge used a dozen cameras all triggered one after another with a set of strings. Leland Stanford had a large farm at which he bred, trained and raced both Standardbreds, used for trotting races in which a driver rides in a sulky while driving the horse; and Thoroughbreds, ridden by jockeys and raced at a gallop. He was interested in improving the performance of his horses of both types and in the scientific questions of their gait action. During July 1877, the photographer Muybridge tried to settle Stanford's question with a series of progressively clearer, single photographs of Stanford's trotter, Occident, at a racing-speed gait at the Union Park Racetrack in Sacramento, California. He captured the horse in a photograph with all four feet off the ground. One of the prints was sent to the local California press, but because they found that the film negative was retouched, the press dismissed it. As negative retouching was an acceptable and common practice at the time, the photograph won Muybridge an award at the Twelfth San Francisco Industrial Exhibition. Lantern slides of the trotting horse photographs survive. The following year, Stanford financed Muybridge's next project: to use multiple cameras to photograph a Thoroughbred at a gallop at Stanford's farm in Palo Alto on June 15, 1878, in the presence of the press. Muybridge photographed the businessman's Kentucky-bred mare named Sallie Gardner running. The Horse in Motion by Eadweard Muybridge. "Sallie Gardner," owned by Leland Stanford; running at a 1:40 gait over the Palo Alto track, 19th June 1878. Frames 1-11 used for animation, frame 12 not used. He had arranged the cameras along a track parallel to the horse's path. Muybridge used 24 cameras which were 27 inches (69 cm) apart. The shutters were controlled by trip wires triggered by the horse's legs. The photographs were taken in succession one twenty-fifth of a second apart, with the shutter speeds calculated to be less than 1/2000 s. The jockey Domm set the mare to travel at a speed of 1:40, which meant that she was galloping at a mile per 1 minute and 40 seconds, equivalent to 36 miles per hour (58 km/h). The stop-action photographs showed the mare lifted all four legs off the ground at certain points during the gallop. Run together, the photographs produced the effect of the horse in motion, or a film. Muybridge produced his prints onsite; when the press noticed the broken straps on Sallie's saddle in the prints, they became convinced of the prints' authenticity. Scientific American was among the publications that carried reports of Muybridge's groundbreaking 1878 work. While there have been rumors that Stanford had a large bet riding on the outcome of the study, the historian Phillip Prodger has said, "I personally believe that the story of the bet is apocryphal. There are really no primary accounts of this bet ever having taken place. Everything is hearsay and secondhand information." 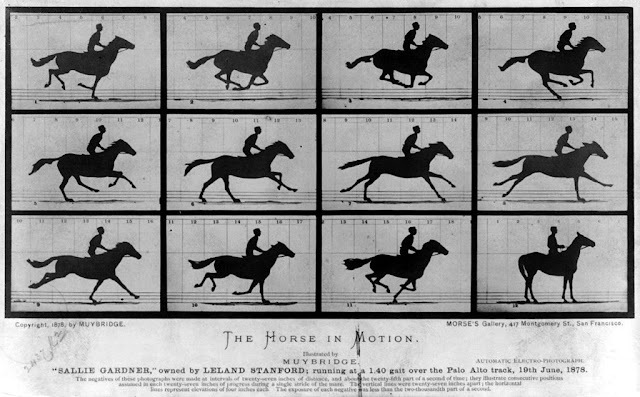 Muybridge sequence of a horse galloping. Animated sequence of a race horse galloping. Photos taken by Eadweard Muybridge, first published in 1887 at Philadelphia (Animal Locomotion).